The Western North Carolina mountains boast warm, isothermal weather that draws people to spend their retirement or vacation here. Lake Lure and the Hickory Nut Gorge offer spectacular views in all four seasons, with plenty of activities to suit any interest! Lifestyle Properties is a locally owned and staffed full-service real estate brokerage, ready and able to assist with your home buying or selling process. We proudly specialize in the areas of Lake Lure, Bat Cave, Chimney Rock, Rutherfordton, Mill Spring, Columbus, southeast Henderson County, and southeast Buncombe County. Exceeding client expectations is our top priority. From homes on the shoreline of Lake Lure to properties with spectacular mountain views, we know the area well. The communities of Rumbling Bald Resort, Vista at Bill's Mountain, The Peaks at Lake Lure, The Highlands at Lake Lure, Riverbend at Lake Lure, Brookside Forest, Laurel Lakes, Sweet Briar Farms, Twelve Mile Post, Firefly Cove, Stonecrest, and others each offer something unique. And if community living is not for you, there's plenty to choose from not in a planned community. As a member of the Carolina Multiple Listing Service (Carolina MLS) we have access to thousands of homes and land listings. We would be pleased to assist in your search for the perfect spot for you! Our website features the best real estate search for homes, condos, and land available. It is the only home search site you will need! It is easy-to-use and updated every 15 minutes by Carolina MLS. Register for a no-obligation "account" with us so you can select criteria, save searches, and get timely email alerts of new listings, price changes, sold data, and market reports. Our Interactive Map Search allows you to view properties on a map or refine your search by drawing boundaries around the area you desire (and if you're not sure we can help with that, too). Curious about what’s happening near you? 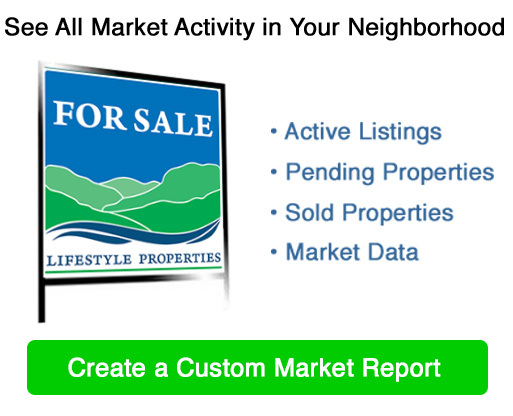 You can create a custom market report to see what’s active, under contract, and sold in proximity to your property! Considering selling or refinancing your home? Please call 828-625-2552 to request a customized market analysis of comparable properties.